From the outside looking in, drum circles can seem mysterious. And the drum circle facilitators can seem even more mysterious. The way they seem to bring so many people together into mesmerizing, pulsating rhythms while saying virtually nothing-surely they must hold some secret, some intangible quality bestowed upon only a few. Not true! 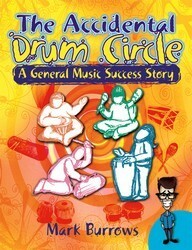 In "The Accidental Drum Circle," Mark Burrows shares how, with no more than two hand-drum lessons to his credit, he put together a drum circle program that reached hundreds of elementary students. This humorous "quick read" addresses everything from how to arrange the instruments and students to the basics of drumming to how to start a groove to how to have a drum circle without drums, and dozens of topics in between. As Mark writes, the purpose of drum circle is immediate-connect people through a shared musical experience that builds community while celebrating individuality. This resource will help you do just that, immediately and successfully!